First attempt to TIG weld two pop cans together. -I also found that it was difficult to melt both sides. -The heat always wanted to go to one side. That ALWAYS happens to me...the trick (for me anyway) is to get a puddle going, then lean that cup back and really push the puddle forward. with the arc and gas.... 4043 by nature "wets" better than 5356 so it should be easier...keep the tungsten close and aim it where there's no heat going(i find myself moving it from the angle edge of one can right over to the other when starting the puddle or if it looses "shape" and needs re-heated. I am going to try that to allow me to melt each side. I know that the 150 Hz causes a stiffer arc, compared to what others have used, but I have found that I can make a smaller weld bead, with the higher frequency. I like it because it allows me to get the arc to dig down into the center trough. I set the max amps to 30, but I let up on the pedal once I start welding so I am actually welding at a lower current. Currently I have 6 250's in the shop that I instruct in. I have found that using a piece of angle iron to help fit the 2 can together is beneficial. Pre cleaning the cans with a stainless or brass wire brush is a must. My students practice with 1/16" 2%thoriated and we use 4043 .030 spool gun wire. After the 2 cans are tacked, the arc must be concentrated in the center of the tack to begin the welds. I have found if the cans are not cleaned properly by remiving the clear coat the arc will take the least path of resistance and melt a hole in one of the cans. A steady hand is a must, and the rate at which the filler metal is added is essential. First thing is punch a hole in one of them so that the expanding gases dont blow out when you close up the last little bit of the weld. second, use 1/16" or even .040" electrode, either 2% thoriated, ceriated, or lanthanated and put a taper on it just like you would for welding on DC. maybe not quite as sharp. Filler metal no bigger than 1/16"
use 4043. 4047 is even better because it has slightly lower melt point and wets out better with lower heat. If you really want to strut, run a really light pass around the ridge of each can where the weld will be, in addition to all the above. Congratulation on the purchase of the 200dx, I am picking mine up "today". I am as well looking for a new Plasma cutter, we will stay intouch and compare notes! [QUOTE=teknition;2770]I recently purchased a Miller Dynasty 200DX and want to practice welding thin aluminum. Not two cans together, but this part of the can is thinner. and here is mine. i only had 3/32 filler and haven't welded alum in a long time. i should have toke more time with it but just banged it out to show some one. and i didn't use any fancy settings. 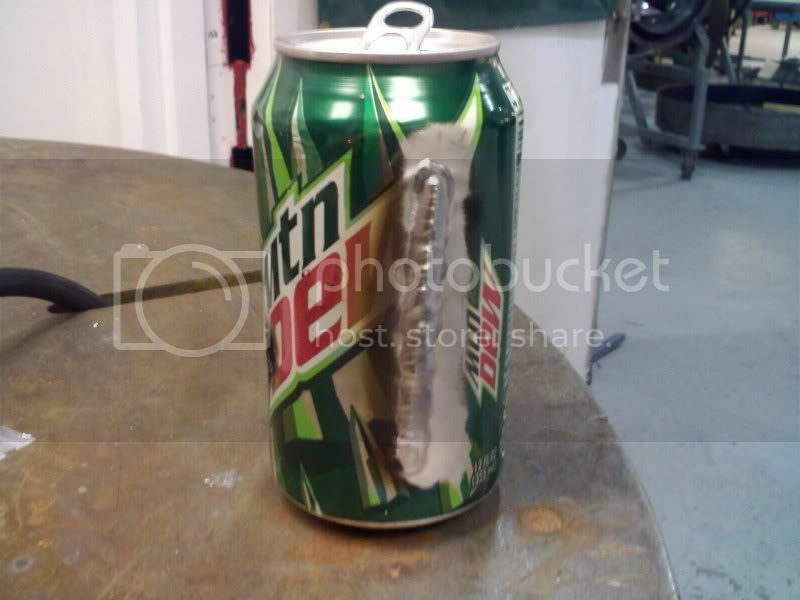 it is the second one i did, the first one had a grounding issue and the hole side of the can blow out. Ive found that Monster cans work rather well...just scotch brite the paint off, and get bare alum...go to town. I used an 1/8th" 2% thoriated electrode, used some 1/16th" rod (3003 I think), and set max at 15 amps. On a Lincoln. Gas flow was about 10cfh. Ive tried welding cans the same way with a miller...doesn't seem to work as well, but again, so many settings I had no clue where to put them all. The best bead I ever had was on one of the 24oz'ers and I ran from the top ridge to about an inch from the bottom before I finally burned through. Great practice for consistency, and pedal control though! Precision is only as important as the project...if you're building a rocket ship...1/64" would matter. If you're building a sledgehammer...an 1/8" probably wont. Xwelder said the side was harder so here is my side shot. i have to weld some alum tomorrow so i used a piece of the stock. it's 1/8. ...I never welded anything to it...props. I just ran the bead and tried to keep it consistent. Imma have to find myself a tig welder I can use, and keep playing around.